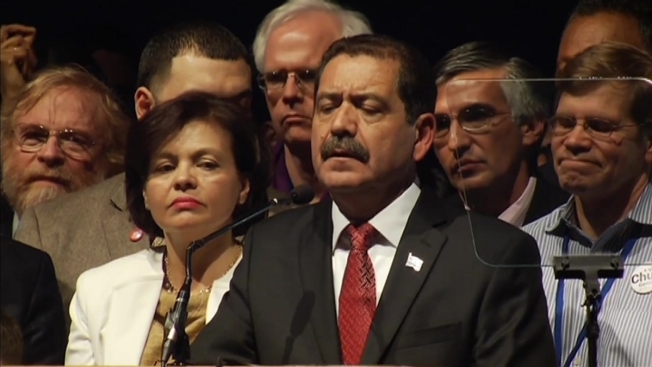 What's Next for Chuy Garcia? All is not lost for Jesus "Chuy" Garcia, but progressive voters who threw their support behind the man who waged a grassroots campaign and forced Chicago into its first runoff mayoral election were certainly feeling disappointed Wednesday morning. "Thank you for giving Chicago something to hope for and bringing a city of diversity together," a supporter named Elva Garcia wrote on Facebook. Garcia late Tuesday conceded to Mayor Rahm Emanuel. Election returns showed he garnered 44 percent of the vote to Emanuel's 56 percent. Garcia Concedes: "We Didn't Lose Today. We Tried Today." Garcia will return to the Cook County Board of Commissioners with immensely higher name recognition and a base of support that has widened over the last several months. Should Cook Board President Toni Preckwinkle step down in 2018, he would be in a prime position to mount a run for that position. "While we fell short tonight, I’m confident that the message we sent will resonate across Chicago and across the nation," he wrote in a message on his campaign website. "We will continue to organize to make our city work for everyone. We will continue to fight for working people and for families." "I couldn’t be prouder of what we’ve accomplished together. I thank you for coming on this journey and the faith and trust that you put in me," he continued. Garcia ran on a platform to fight for the voters he said have been ignored or marginalized by the Emanuel Administration. He was handpicked by the Chicago Teachers Union -- a group furious with the incumbent because of a bitter contract battle and the closure of 50 neighborhood schools -- and vowed to institute an elected school board, ditch the city's red light cameras, and expand the police force. Despite his lack of specifics on how to pay for his initiatives, his voice resonated with a large contingent of voters. "Thank you for helping us see we can go the distance," ValSan Santiago wrote. "Please don't let this sway your decision to run again... If at first you don't succeed try, try, try again!!!!!!!"